Conducting integrative 24/7/365 mountain system monitoring at the Senator Beck Basin Study Area that captures weather, snowpack, radiation, dust-on-snow, soils, plant community and hydrologic signals of regional climate trends. Why is the CSAS’s Senator Beck Basin Study Area important to Colorado? The 720 acre, alpine Senator Beck Basin Study Area at Red Mountain Pass (SBB) was established by CSAS in 2003 to monitor for and detect climate-driven changes in regional mountain snow systems, and to foster new research on mountain snowpack and snowmelt processes. SBB is an unique asset for the Colorado water management and hydrologic modeling communities faced with year-to-year resource variability and potentially more severe drought episodes. Why is our location critical to understanding the Colorado snow system? Senator Beck Basin (SBB) is located in a critically wet and cold portion of the Colorado River Basin, as identified in the recent Basin Study. SBB’s alpine location in the western San Juan Mountains, the first major mountain system downwind of the desert Southwest and Colorado Plateau, is well situated to enable monitoring of regional warming, drought, changes in precipitation phase, and other water yield-affecting processes such as dust-on-snow and spruce/fir forest conditions. What is Mountain System Monitoring? Climate change researchers around the world have recognized mountains as a sensitive bellwether of global and regional change, where ‘system responses’ are more transparent and perhaps quicker to present than in lower elevation settings. Understanding the complex system interactions governing the seasonal distribution of mountain snowcover, its storage and release of water, and the effects of climate on those processes, are clearly of increasing importance to Colorado water providers. What is the CSAS Annual Budget? CSAS has bootstrapped its first decade on subsistence funding of up to $140,000/year. To ensure continuous operation of Senator Beck Basin, sustain our Mountain System Monitoring program, and to continue to host research, CSAS needs to grow its budget to $200,000 per year. CSAS seeks the majority of its funding from stakeholder agencies and organizations. 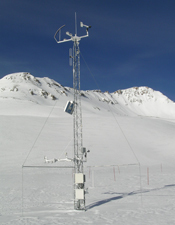 SBB is the primary sentinel site for the CSAS’s Colorado Dust-on-Snow program. SBB data are providing a platform for hydrologic model development and testing by an NCAR team, led by Dr. Martyn Clark, for application in the CBRFC Community Hydrologic Prediction System (CHPS). Numerous studies in the Colorado River Basin have identified the need for improved monitoring for climate change in the system. SBB data are critical to ongoing research on the impacts of mountain system warming. SBB also provides validation of remote sensing characterizations of catchment scale mountain system behaviors. Data from the alpine SBB area, and the study area facilities themselves, complement other data sets and research venues, such as the high desert USFS Reynolds Creek Experimental Watershed. What are the CSAS science products? Senator Beck Basin data constitute the foundation for the science that CSAS conducts and for the research we host and support. SBB datasets are published, in several formats, after each water year and are of particular use by modelers. CSAS also posts ‘real-time’ data from each of the four SBB study plots. Graphical products are produced monthly and seasonally. 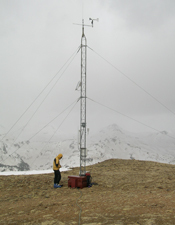 CSAS commissions analyses of its Mountain System Monitoring data. 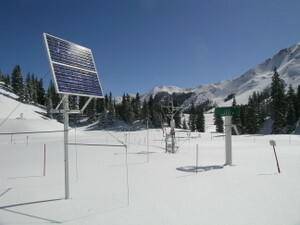 CSAS’s Colorado Dust-on-Snow program posts updates throughout the year. Finally, peer-reviewed scholarly publications by researchers using SBB facilities and/or data have and will continue to contribute to increased knowledge across a wide range of mountain science domains, including snow and mountain hydrology. What research relies on Senator Beck Basin? CSAS hosts field studies at SBB and provides SBB data to academic and agency research groups focused on snow and mountain hydrology. Research teams are currently investigating new technologies for snowpack SWE monitoring (Boise State Univ., Army CRREL), improving snowmelt models (NCAR, Boise State, USFS Reynolds Creek), developing remote sensing algorithms for snowmelt forcing by dust (JPL/UCLA, Western Water Assessment), exploring long-wave radiation effects on mountain system warming (Columbia, Rutgers), and modeling snowcover distribution and atmospheric river events (NCAR, NOAA). New hydrologic and climate related research starting in summer 2013 includes a spruce beetle team from Colo. State Univ., and an SBB soils survey by NCAR’s Hydrometeorological Applications Group. 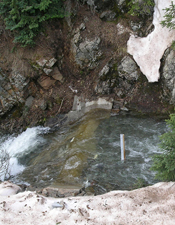 What measurements are made at Senator Beck Basin?